With the Archon IB-EX2, Thermalright has an impressive, high-quality single tower cooler in its portfolio. Equipped with six heatpipes and two 150 millimeter fans in the delivery, this cooler means serious business. Apart from that Thermalright decided to provide this cooler with a great looks, which makes it even tastier. With their Archon IB-E X2 Thermalright launches a powerful tower cooler, which can be equipped with two fans measuring 150 millimeter in diameter. At a first glance this is cooler features very high build quality and insanely good looks. Compared to its predecessor this particular cooler measures 5mm less in height, which should lead to better compatibility with some enclosures. There is a total of eight heatpipes, all which have a six millimeter diameter. All of those heatpipes pass through a nickel plated copper base plate. Additionally, there are two well-known TY-141 PWM fans, which start rotating already at 900 RPM and can go all the way up to a very reasonable 1'300 RPM. Some of you might remember the Archon SB-E X2, which compared to the new Archon IB-E X2 model, was a bit taller. The reason for that lies in the compatibility with some PC cases. On the other hand, it's actually quite surprising that both of these coolers are equally heavy. 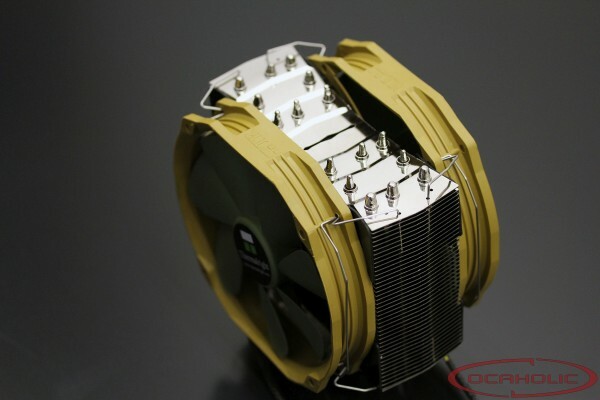 A closer look at the materials used on the Archon IB-E X2 CPU cooler shows you the usual Thermalright mix. You get a nickel plated, mirror finished, base plate , eight nickel plated copper heatpipes, which are all six millimeters thick, as well as an aluminum fin stack, that has been nickel plated too and soldered to the heatpipes in order to provide maximum thermal conductivity. For optimal heat transfer the heatpipes are spead widely across the heatsink in order to transfer the heat to more surface. Examining the base plate reveals you get a mirror finish while the manufacturing quality is very high. When it comes to fans, you get pretty much the same level of quality as with the cooler itself. The TY-141 PWM fans can spin as low as 300 RPM, which, in the end, when pushed to spin at this low speed, means that you won't be able to hear them. We also liked the fact that anti-vibration rubber pads are included in all four corners and on both sides of the cooler. What is also worth noticing is that, although cooler and fan combined do not take a lot of space, the fan has to be unmounted in order to install the heatsink to the motherboard. 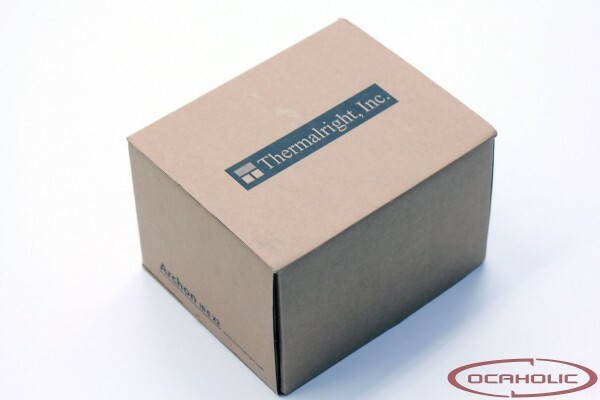 The bundle and the box are quite simple but that does not mean that Thermalright did not do a good job at this point too. Inside the box you will find everything you need to put things in place and the mounting kit offers great compatibility. The box is made out of solid cardboard and although it is only protected by a plastic shroud our sample arrived without a single dent or any damage whatsoever. The bundled fans are not attached to the heatsink while the rest of the mounting components are placed in a separate box on top of the cooler. The bundle includes an installation manual, mounting components, four fan clips, two TY-141 fans and of course the heatsink itself, while thermal paste comes in a separate 1g syringe. You also get the aforementioned anti-vibration pads and the PWM Y adapter for the fans.